A colleague of Halton Arp and the observations that quasars are linked to galaxies. 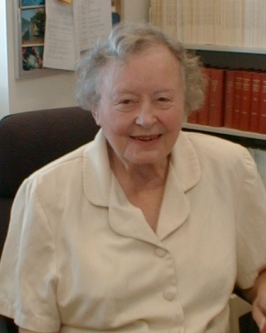 Eleanor Margaret Burbidge, n?e Peachey, FRS (born August 12, 1919 in Davenport) is an English astrophysicist, noted for original research and holding many administrative posts, including director of the Royal Greenwich Observatory. During her career she served at the University of London Observatory, Yerkes Observatory of the University of Chicago, Cavendish Laboratory in Cambridge, England, the California Institute of Technology, and from 1979 to 1988 was first director of the Center for Astronomy and Space Sciences at the University of California at San Diego (UCSD), where she has worked since 1962.